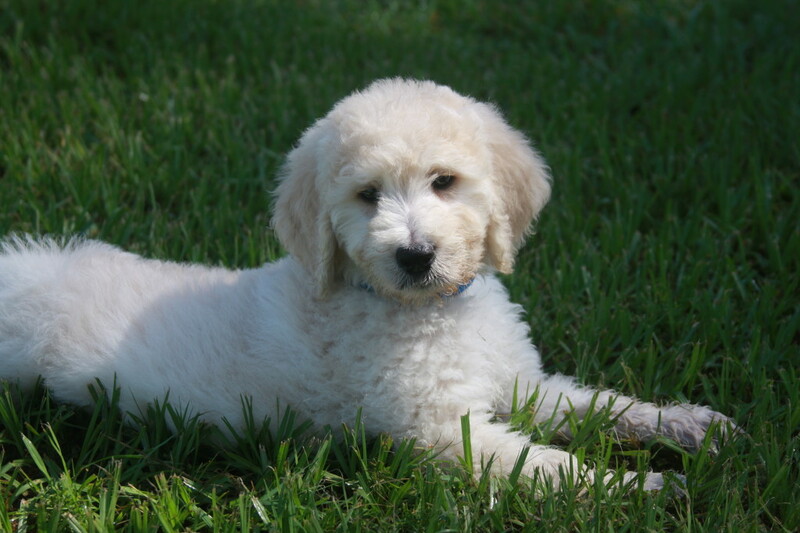 Sailor was born on June 13, 2013 at Moss Creek Goldendoodles. His mother is Jazz, a black Standard Poodle and his father is Bentley, a white F1 Goldendoodle. 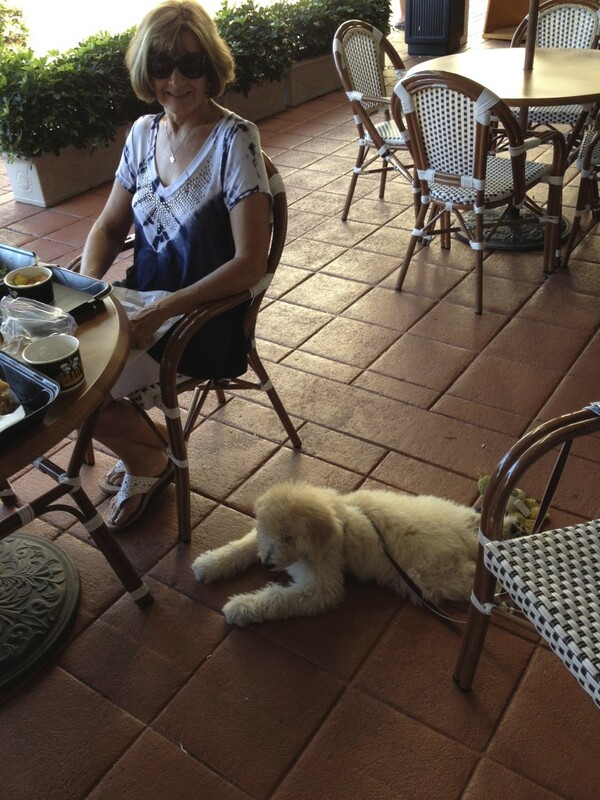 Bentley’s parents are a Standard Poodle and an English (white) Golden Retriever. 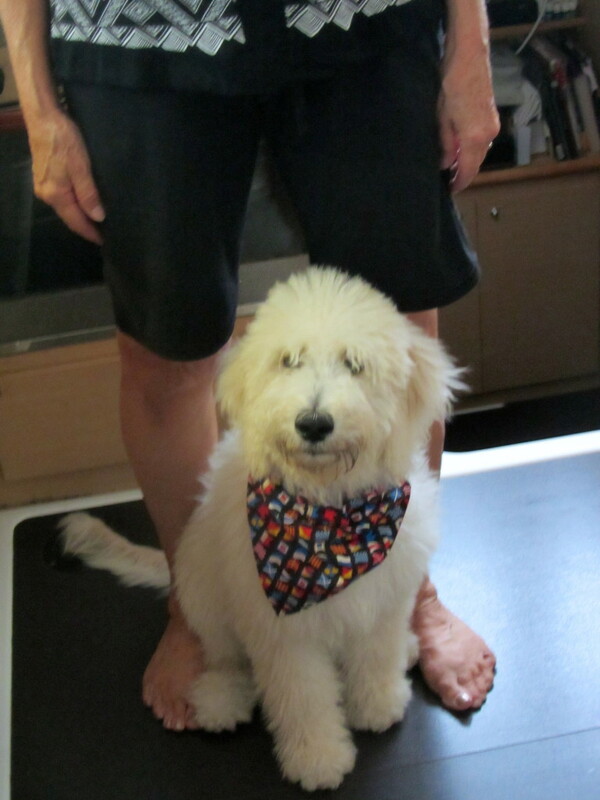 Sailor is an F1B Goldendoodle because his parents are a Goldendoodle and a Poodle. He is less likely to shed and is 3/4 poodle, unlike the F1 Goldendoodles who are half Poodle and half Golden Retriever. His breeder took and posted photos of his litter on Shutterfly through six weeks. Below are some of those photos as well as ones taken at Boot Camp and ones we have taken since he came home with us. So returning readers don’t have to scroll to the bottom, we will group Sailor’s pictures as he grows up by months, with the newest at the top. We decided to take a picture of Sailor standing between my knees occasionally and compare it to the one we took the first time we met him at two months old. The two month old one is at the bottom of this page, but I am putting it below to this one to show how he has grown. He weighs 25 pounds now. Here is a photo of the litter a few hours after they were born. Sailor has the blue coliar on. This is the one week old picture of the litter. Now they are two weeks old. Below they are three weeks old. At seven weeks old, we got a video of the litter playing in a toy room. 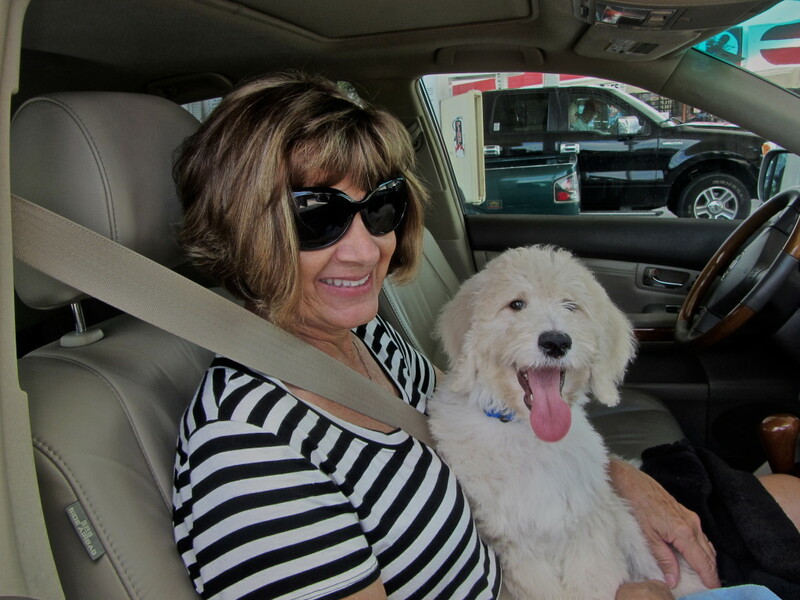 At eight weeks, we visited Sailor at Moss Creek Goldendoodles. Here are several pictures we took, as we fell in love with him. Sailor left that day with Boot Camp trainer Charanun to stay with him, his wife Heather and their dogs for four weeks. During that time we received weekly “report cards” and updates as well as photos. Below are a few of those pictures. 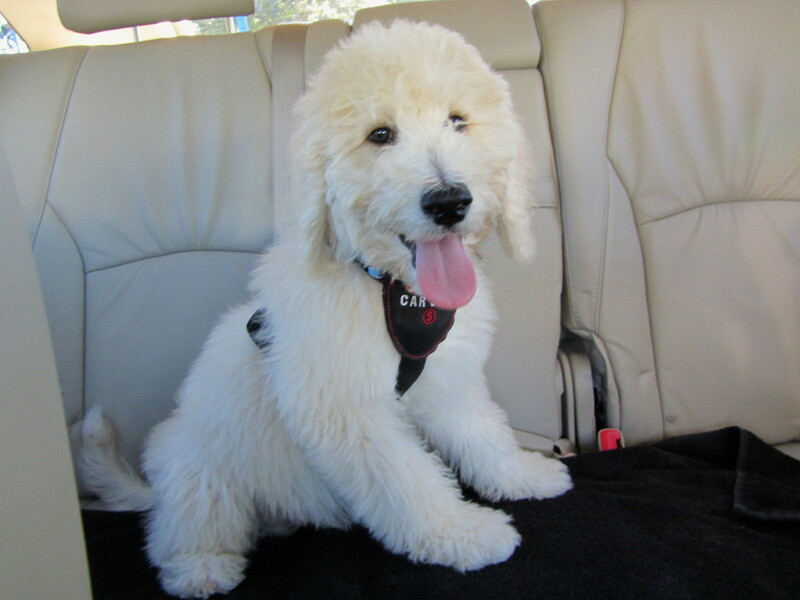 At twelve weeks, we returned to Moss Creek Goldendoodles to pick up Sailor and take him home. He loved riding in the car on my lap for 2 1/2 hours back to Stuart. 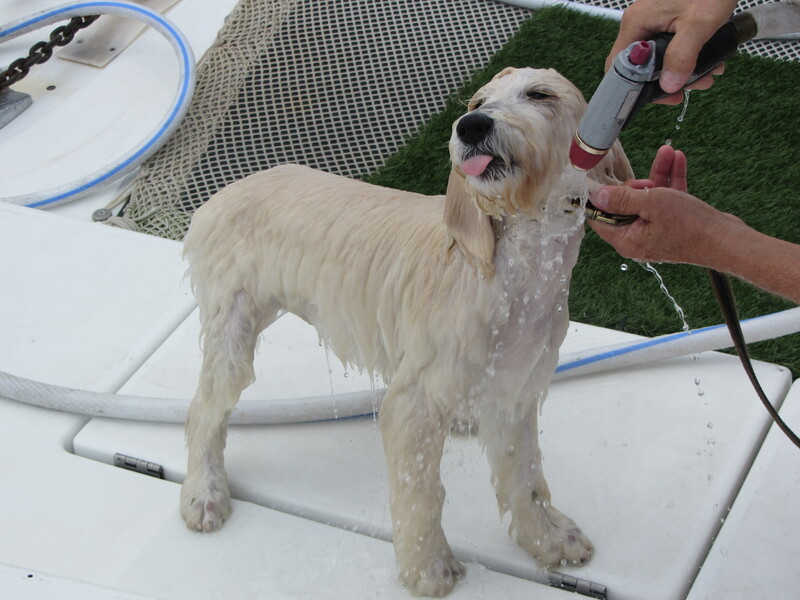 When we got back to the marina, Sailor walked nicely down the long dock to the boat. He seems to like his new car harness. He can’t quite see out the windows yet, but he was content to sit alone in the backseat. He didn’t mind taking a shower on the trampolines. We took him out with us to dinner and he was a perfect puppy, sleeping under the table most of the time.